The investment funds of the Cleveland Foundation are guided by an Investment Committee, which is comprised of directors and external volunteers who are knowledgeable in investment and financial matters. The Investment Committee is advised by an independent consultant who, along with staff, assists in setting the investment policies and guidelines that govern the investments. The Cleveland Foundation Flagship Pool combines a number of donor funds into a single portfolio. The pool allows participating donor funds access to investment managers and products that traditionally require a very high initial investment. The Cleveland Foundation Flagship Pool follows a multiple-firms approach in which managers are hired for a specific asset class. 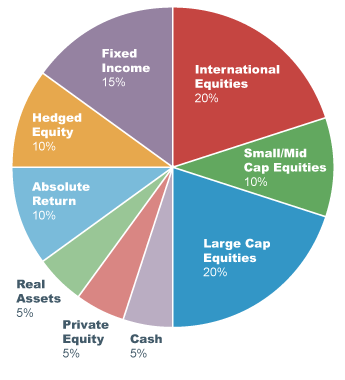 This method gives the pool the broadest diversification possible in both asset classes and managers. 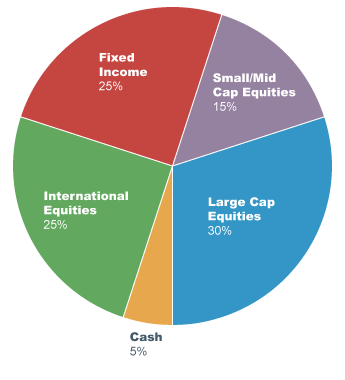 The Cleveland Foundation’s Investment Committee has set a target asset allocation for the pool, illustrated in the chart to the right. The Investment Committee regularly monitors the performance of each of the pool’s managers to ensure they are continuing to meet the foundation’s investment standards. The foundation, by declaration of trust, maintains active relationships with four trust banks, including KeyBank, PNC, Huntington, and JP Morgan and has also allowed local investment firms to manage assets. Because of the diversification of investments they offer, firms and banks provide a balanced investment approach through the use of specialized managers and multiple investment products in a given asset class. Firms and banks typically pool individual donor funds to provide greater administrative efficiencies and custody the assets with KeyBank. The firms and banks follow the asset allocation guidelines of the investment policy set forth by the Cleveland Foundation’s Investment Committee. Staff meets with the firms and banks at least twice annually, and the Investment Committee regularly monitors the performance of the managers to ensure they are continuing to meet the foundation’s investment standards. For the largest pools, which are managed by KeyBank and PNC, the target asset allocation is the same as that for the Cleveland Foundation Flagship Pool. For all other firms and banks, there are two sets of guidelines from which they can choose to manage assets, one with and one without alternative investments such as real estate, hedge funds, etc. The guideline targets are illustrated below. Individual advisors are an option for donors looking to establish a significant fund (> $1 million) with the Cleveland Foundation while maintaining a relationship with their existing financial advisor.